Oenophily - Page 4 of 5 - For the love of wines. Pierce’s Disease (shown below) can kill a grapevine in 3 to 5 years. Outbreaks occur every 15 years or so in California and contribute to higher wine prices. 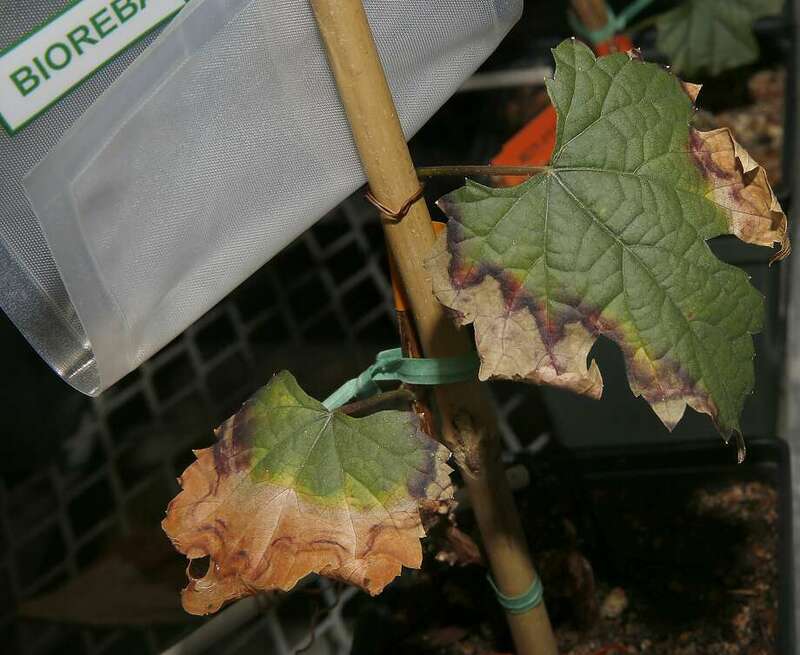 To combat this problem, a UC Davis researcher has bred several varietals of grape that are resistant to the disease. At a recent tasting of the first wines made from these new grapes, Michael Silacci of Open One commented, “I think we may have the next cult wine.” Wow. Get the full story in Esther Mobley’s San Francisco Chronicle article. Author BradPosted on February 1, 2016 February 12, 2016 Categories Wine Science1 Comment on The Next Cult Wine? As any wine lover knows, aroma is a big part of tasting wine. It gives us information about what’s in our glass and shapes our perception of taste. What our nose is telling us is a big part of any wine conversation. However, sometimes putting a name to the smell can be tough. At a tasting, the wine representative may give some suggestions. In a group of friends, people can toss out ideas until someone says, “That’s it!” But when these resources fail or are unavailable, then what’s an oenophile to do for inspiration? The folks over at vinography.com have an aroma card that might be of help. Check it out and never be at a loss for words again. Apparently I’m not the only one thinking (or writing) about wine history this month. Here is a fun post from winedabbler.com about The History of the Taste of Wine. A Rosé Future for Port? I’ve been a fan of Port for a long time, so when I saw the article Fortified Wine’s Final Generation? by James Lawrence in my inbox, it caught my interest. The article discusses the steady decline in fortified wine sales over the last few years, and some of the things the industry is doing to try and reverse that trend. One of the things mentioned is Croft Pink Port, and that made the timing interesting too as just last weekend I was at a wine tasting where they were pouring this product. While “pink” and “sweet” don’t necessarily make a favorable association with “wine” in my head (looking at you, white zinfandel), I think it actually works in this case. Made using only brief skin contact followed by fermentation in stainless steel, Pink Port has a much more delicate nose than traditional Ports. This means the alcohol is quite noticeable, but it is supported by enticing floral, raspberry, and honey aromas. The taste is sweet but delivers the promise of the smell with the addition of a distinct watermelon note. Pink Port should be served chilled, or even over ice, which will help tone down the sweetness. Croft recommends it as an aperitif and also extols its virtues as a cocktail mixer. When I started to think about food pairings, I wanted to try it with spicy Southeast Asian seafood or chicken. At dessert time, I think I would choose something with tart berry flavors (e.g. blueberries or cranberries)… maybe a cheesecake with cranberry sauce. The idea behind Pink Port is to try and attract new drinkers. I think it will accomplish that objective. Whether it can then get them to cross the boundary to more traditional versions of Port remains to be seen. Author BradPosted on January 27, 2016 January 27, 2016 Categories WineLeave a comment on A Rosé Future for Port? An interesting piece on the effect of soils on wine by Washington Post columnist Dave McIntyre. Author BradPosted on January 25, 2016 January 26, 2016 Categories WineLeave a comment on Digging into Terroir. Literally. Wines that dedicated enthusiasts are willing to pay large sums of money for are often called “cult wines”. Some examples are Screaming Eagle from California and Penfold’s Grange from Australia. One of the main grapes used to make Falernian wine is generally believed to be the one that we call Aglianico today. Also called the ‘Barolo of the south’, Taurasi wines tends to be full-bodied wines with large structure. They are usually an almost opaque ruby color with hints of purple. Powerful with refinement, they can be a bit overwhelming when young but mellow as they age. One of the wines I represent is a 2011 Taurasi from Cantine Catena, and it fits this description pretty well. It presents cherry aromas with hints of spice. The promise of the nose is delivered on the palate with cherry and jam flavors followed by a bit of clove and a touch of toasted wood. A young wine, this Taurasi is very fruit forward with pronounced tannins now. An hour or two in a decanter opens it up, revealing the underlying structure and complexity that promises to develop as it ages. Even the Romans knew about Anglianico’s great aging potential. Falernian wine was typically aged for 15 to 20 years. Roman historian Pliny recorded that a Falernian from 121 B.C. was served at a banquet in 60 B.C. honoring Julius Caesar’s conquests in Spain, some 61 years of aging! I like wine. I like cooking. I like cooking with wine. Did you know that old leftover wine will add the same flavors to your meals as freshly opened? Read what Tamar Adler, author of An Everlasting Meal, has to to say on the subject in her New York Times Magazine article. Italy has the world’s richest variety of individual wine styles, distinctive terroirs, and indigenous grape varieties. – Hugh Johnson and Jancis Robinson in The World Atlas of Wine. No matter what individual taste preferences are, there is an Italian wine for every wine drinker. However, learning to navigate the Italian wine landscape can be a distinct challenge. Europe’s appellation based wine laws can be confusing enough for U.S. consumers, but Italy raises the difficulty to another level. Unlike other countries where the appellations are based on geographic location or terroir, the Italian system defines regions in terms of the end product. A single vineyard can potentially be regulated under several different appellations in Italian law; the actual rules applied will depend on the final wine produced. Then there are the more than 350 different varieties of grape approved for use under Italian wine law (as compared to just over 60 varieties in France)! That’s just for the DOC and DOCG wines. Another 500+ varieties of grape have been documented in Italy and some claim there are at least 1,000 more beyond that! Add winemaking processes such as appassimento and ripasso, which are used more widely in Italy than anywhere else in the world. Finally, factor in the exciting things happening under Italy’s IGT classifications (Super Tuscans, for example), and the result is a stunning diversity of wines that capture thousands of years of winemaking history. So… the question becomes how to navigate such a complex landscape? The answer, of course, is to start with the grapes. Though there are hundreds of varieties grown in Italy, the list of important ones is much shorter. Since Italian appellations are tied to the end product, knowing the varietals used provides a frame of reference for learning the regions. From there it is just a matter of learning the relationships. And don’t forget the good part– the best way to learn is by tasting!